Fengdu Ghost City in Chongqing is a hot destination for many visitors and Yangtze River cruise travellers. This extremely old place is featured with the culture of “ghost” in China, and also a treasurable storage of the folk culture about Taoism, Buddhism, and Confucianism together. Fengdu Ghost City (丰都鬼城) is among the most popular attractions for Yangtze River cruise visitors to China with its famous constructions and displays of culture of “ghost” and the hell and the important function of spreading the traditional values in Confucians, Taoist, and Buddhist believes, and the value of “good people will be treated well, and bad people will be punished after death”. Located on Mingshan Mountain (名山), at the north bank of Yangtze River at Fengdu County in Chongqing, Fengdu Ghost Town is nearly a must-go place for Chongqing visitors and serves as the first shore excursion site for Yangtze cruises. Besides, it is not only “National AAAA Tourist Attraction”, but also a “Famous Cultural & Historical City” originated from the Han dynasty in ancient China, for almost 2,000 years old. Fengdu Ghost City has no ghosts at all. Among all the versions about the formation of Fengdu Ghost City, the most told is the story about immortalization of Yin and Wang. According to the legend, two people called Yin Changsheng (阴长生) and Wang Fangping (王方平) came to Fengdu to try to cultivate vital energy and later became immortals. People later in Tang Dynasty misnamed them “Yinwang” by combining their family names of “Yin” and “Wang” together into “Yinwang”, which means the “King of Hell”. Therefore, Fengdu Ghost City got its name. Afterwards, with the non-stopping renders in the literary works for long time, the reasonable combination of Chinese culture about ghost with the Buddhism, Taoism and Confucianism, the mix of local Ba-Yu culture and others from the external regions, the collision of multiple art styles of architectures, sculptures and paintings, the well-known “Culture of Ghost City” finally came into shape, and Fengdu Ghost City is treated as the “destination for the soul of deceased people”. Therefore, if you are interested in the so excellent combining work, you can take some time to enjoy in Fengdu Ghost City. In Fengdu Ghost City, you could visit dozens of interesting places and constructions, among which don’t miss the highlighting Bridge of Troubled Water, Emperor’s Palace, and Gate of Hell to know more about the culture of ghost in China. The Bridge of Troubled Water or Naihe Bridge (奈何桥) is situated at the half way on Mingshan Mountain. It is regarded as a bridge connecting the past and present, the hell and the real world. the left bridge is for health symbolizing being healthy each year, while the left one is for wealth standing for being rich every year. For couples, you could walk together with hand in hand in even steps, and for single visitors, odd steps, so that you can live happily and peacefully. It is legendarily said the Naihe Bridge is the first test among all the “Three Tests” for people after death, and the dead people would drink the Mengpo soup, walk through that bridge, and then forget all the things happened in the previous life and get the next new life. According to the folk tales, after death, while walking through the bridge, virtual people will have God and Buddha to protect, while the evils will be punished to fall in the “pool of blood” and be tortured by the snakes and dogs in the muddy wave. So every year on the pilgrimage occasion, many pilgrims would through copper coins, ghost money, and stirred rice into the pool for the hungry ghosts. Emperor’s Palace (天子殿) facing the east was firstly built in West Jin Dynasty, about over 1600 years, and the present standing construction was built in 1663, over 300 years old. This palace covering a whole size of 2,431 s. q. m., is the key part of Fengdy Ghost City, and also the most historical, largest, and best preserved temple construction on the Mingshan Mountain. That is the place of the “Maya” who is the “King of Hell”. It consists of an archway, gate, and the palace on an axis. And here in front of the gate, people would do the second test. Dead people are required to stand on the stone there on one foot. And good people can stand for 3 minutes, however, bad people can’t do that and will be punished to the hell. Apart from that, in the palace, there imitates the scene in the hell with the thick atmosphere of dark and gloom. You could see the statues of the king of hell, officials of different appearances, and many torture scenes displayed there. And that also expresses the opinion of praising virtue and punishing vice. It is legendarily said that the Gate of Hell (鬼门关) is the only way to the hell. Whoever coming here would have to get the check of the road pass which is the evidence to register in the hell after death. With that pass, dead people can go to the hell and go up to the heaven for the upcoming of the next life without any obstacles. Fengdu Ghost City on Mingshan Mountain, at Fengdu County, Chongqing is about 172km from downtown Chongqing. Visitors taking a Yangtze River cruise can visit Fengdu Ghost City during your cruise time, and with the local guide, you don’t need to worry about the transportation. Check which Yangtze Cruise ships visit Fengdu Ghost City. And for other travelers, you could take a special cruise ship from Chongqing Chaotianmen Port to Fendu Port for about 6 hours. And the ship stops in front of the scenic spot. Also, you could take a coach from Chongqing Chaotianmen Coach Station to Fengdu new county, which departs nearly every one hour and needs, then, you could transfer to the local bus No.109 or directly get on a taxi to arrive at the site. Besides, if you drive, it would take about 2 hours and 15 minutes covering about 150 kilometers. 1. Many steps to climb: since Fengdu Ghost City is built on the mountain area, there would be many steps (about 800 steps) need to walk up to the top place. For people who have weak legs or of advanced age, it is suggested visit Fengdu Ghost City according to the real condition of your body. If Yangtze River cruise visitors don’t want to visit this place, you can also spend leisure and wonderful onboard with the multiple activities and lectures. 2. Temple Fair: during March 3rd-5th every year, there is the annual temple fair held at Fengdu Ghost City, when many different kinds of performances and activities would be prepared for visitors from all places in the world. Do you see the chinese culture on the tour to the Tribe of Three gorges? The Tribe of the Three Gorges is a site where you could enjoy the very primitive scenery of water, hills, old structures of peculiar styles, enjoy the interesting and pure folk culture of Tujia minority, and savor the special mixed culture of Ba and Chu peoples in Sichuan, Chongqing, and Hubei regions. 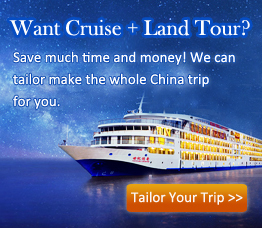 And that is a highly popular site for Yangtze River cruise travelers from many countries and regions.